Summary: Andy Barber has been an assistant district attorney in his suburban Massachusetts county for more than twenty years. He is respected in his community, tenacious in the courtroom, and happy at home with his wife, Laurie, and son, Jacob. But when a shocking crime shatters their New England town, Andy is blindsided by what happens next: His fourteen-year-old son is charged with the murder of a fellow student. This is one of those days when I'm really happy that I started Mystery Mondays. For those of you who don't know, I began reviewing a mystery/suspense/thriller once a week in the hopes that I'd challenge myself to read more of this genre. I have always loved a good thriller and I found that I wasn't reading many of them anymore, so I figured a weekly post would kind of "force" me to read more. 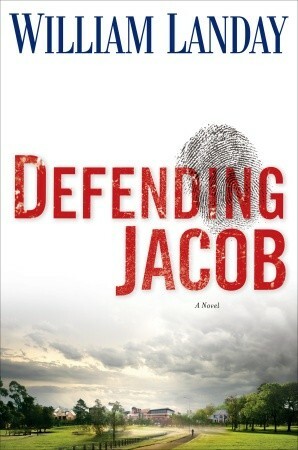 And it's because of Mystery Monday that I picked up DEFENDING JACOB by William Landay. A few months ago, I received an advance copy of this novel and I found the cover to be rather interesting. Instead of a "typical" book cover, the cover of DEFENDING JACOB contains a letter from the publisher raving about the book. The back cover details their national marketing campaign. So basically, I picked up DEFENDING JACOB knowing next to nothing about this book... except that the reading experience compares to that of PRESUMED INNOCENT. When I read this, I swore that I wouldn't make the comparison, but honestly, I can't help it. DEFENDING JACOB provided me with almost the exact same punch to the stomach that PRESUMED INNOCENT did. And yes, I think this novel is every bit as suspenseful and entertaining! I kind of like that I knew very little about DEFENDING JACOB when I first picked it up, so I hesitate to give too much away in my review. I think the publisher's summary that I included above is pretty decent and doesn't include any spoilers. In a nutshell, DEFENDING JACOB is Andy Barber's story about his teenage son Jacob being charged with the murder of a classmate. It also shows the lengths parents are willing to go to protect their child. DEFENDING JACOB has, without a doubt, a very intriguing mystery that I absolutely devoured. And don't even get me started on the ending -- it blew me away! I thought I knew exactly where this book was going on multiple occasions, but boy was I wrong! DEFENDING JACOB had quite a few twists and turns and most of them were on the last few pages of the novel. Despite loving the suspense aspects of DEFENDING JACOB, I also appreciated some of the subtler aspects of the story. First of all, I loved how the author told this story. The novel is written in Andy's voice, along with snippets of some of Andy's testimony; and I think Andy is a fantastic narrator. I felt as if Andy were a very authentic character and I found him to be fascinating given his past baggage as well the way how he handled the investigation and courtroom proceedings. I also liked how DEFENDING JACOB explored a family in crisis. This novel explored so many aspects of family life -- from secrets, to high stress situations, to a failing marriage, to discovering that your child might not be who you thought he was. Maybe it's because I'm a mother of a middle-schooler, but this book affected me deeply -- much more so than most thrillers. And I absolutely love how it made me re-think things about my life and how I'd react to certain situations. I highly recommend DEFENDING JACOB to readers who love suspense and legal thrillers. Beware, though, when you pick up this novel, you better have a few hours to spend reading it. It's one of those books that you can't put down. Second very positive review I've read of this book today. Yes, it must come next. I think the whole comparison to PRESUMED INNOCENT is a big plus too. Sometimes comparisons are not desirable to me, but as I loved Scott Turow's book so much, it is a good thing. I also love books that leave me pondering things afterward. Thanks for the your review, Julie. Wow! I still remember how I felt after I read Presumed Innocent. I can't wait to read this. Holy cow ... between both you and Dawn posting reviews about this today, I'm totally hooked! I have this on my pile and like you didn't know too much about it. I am anxious to read it now! Glad to hear you enjoyed it so much! My review is posting tomorrow! I was also blown away by the ending! Damn you all! How in the world am I supposed to get anything done when you keep reviewing these books that I must have???? Presumed Innocent was as good as it gets, really. If this book rivals that one, I need it. That's it, it's over. I'm also trying to read more thrillers this year, and this book premise has me hooked. Your review too! This sounds like a book I would love. Thanks for the review. I just finished it over the weekend, too, and it was fantastic...I was caught up in every word. Every review I read of this one makes me want to read it more.